Norma Jean Wright was born in Ripley Tennessee, not far from the city limits of "Nut Bush", which is, where Tina Turner was born. As a mater of fact Norma's father attended the same church as Tina, and by the time Norma was old enough to attend elementary school, her dad moved the family to Elyria, Ohio. Her interest in music stemmed initially, from an older cousin, who happened to be an ardent Sam Cooke fan. Intrigued by Sam Cooke and her cousin's voice, she tried to mimic them only to discover it required more talent than she had. So Norma, convinced her mother to let her join the church choir, where she began to hone her craft. While growing up in Elyria, her father would often drive them to Detroit to visit her cousins, which was only three hours away. During these trips Norma caught glimpses of the motor city during Motown's heyday, and she fell in love with the music of Marvin Gaye, Stevie Wonder, and Gladys Knight. She was also a student of Nancy Wilson and Aretha Franklin. Years later, after graduating from Ohio State, she caught a break with the Spinners, performing with them (as Dione Warwick's stand in) singing their duet "Then Came You". This brief stint led her into relocating to New York City, where she met Luci Martin in the Soul/Rock band ESP. Trading leads the duo realized their sound was unique and it enabled them to land a nice gig in Canada, but prior their departure Norma recorded lead vocals on original songs for band mates, Bernard Edwards, and Nile Rodgers. Still in Canada, months later, Edwards, contacted her and requested that she return to NYC, because Atlantic Records wanted to sign the group. Once the album was completed, they wanted to add another female to the lineup, so Luci and Norma, teamed up again, this time, fronting the group Chic. With all the success generated by Chic's debut album Norma Jean, was nominated by Billboard and Record World as top new vocalist. This prompted Rodgers and Edwards to solidify a solo deal for Norma and they returned to the studio and produced her self titled album, spawning hit single "Saturday". Following her departure from Chic, Alfa Anderson stepped in to replace her alongside Luci Martin. After Chic, Norma branched off into songwriting and production. She co-penned signature song "Rising To The Top", which was later recorded and sampled by Doug E Fresh, Mary J. Blige/Love No Limit, LL Cool J/Paradise, and by Nas. She sang background on Sister Sledge's Grammy nominated album "We Are Family", then loaned her voice to Madonna's debut album, plus sang on Luther Vandross' "Never To Much" and Aretha Franklin's "Jump To It". When filmmaker-turned-record-executive, Spike Lee surveyed the music scene in search of a group to launch his 40 Acres and A Mule Music works/Sony, he zoomed in on State of Art, and signed former chic keyboardist Raymond Jones and Norma Jean. The two of them produced and co-write their critically acclaimed album "Community" featuring South African artist Ladysmith Black Mambazo and Bootsy Collins. By 1996 Luci Martin and Norma Jean re-emerged to co-write and record new single Let's Bounce for Japan's artist GTS, and soon after they started touring again. 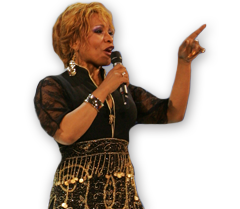 Now fast forward to 2014 where Luci and Norma are currently working on several projects together, one includes them working with former lady of chic, vocalist, Alfa Anderson. The three of them will tour with Martha Wash, and Linda Clifford under the banner of First Ladies Of Disco, which is the title of the book written in 2013 by author James Arena. This book includes a chapter on Norma Jean as well as chapters on thirty-one additional female vocalists, and they were all trail blazers of the disco era. With all these new ventures on the horizon, one can only imagine, all the while looking forward to witnessing what Norma Jean Wright will grace us with next.